I made this operation breakdown in my college days as one class assignment. I visited one garment export house (factory) to study garment for this assignment. That time factory was making Cargo Pants (in Khaki fabric). It was a nice product. When I started making an operation breakdown, first I was overwhelmed by looking at number of operations of the cargo pant. In a cargo I can only see double needle stitching with thicker threads. Don't know where to start and how to breakdown operations. Then I follow the process, the way line was making that cargo pant. Finally I made it and corrected later stage. I did time study for most of the operations and also did motion study using SPD code and TMU values (Sewing Process Data). Here I am only sharing operation breakdown and machine types used for operations. I don’t have the actual image of the cargo pant that I had studied. Following image is just for an indication. Construction and styling of the actual cargo pant was different than this one. The cargo pant that you have may be different in styling and construction. By reading operation name here you can relate with your product and refer this for making your operation breakdown and modify where needed following your sample. Do you find this post useful? Post your comment. 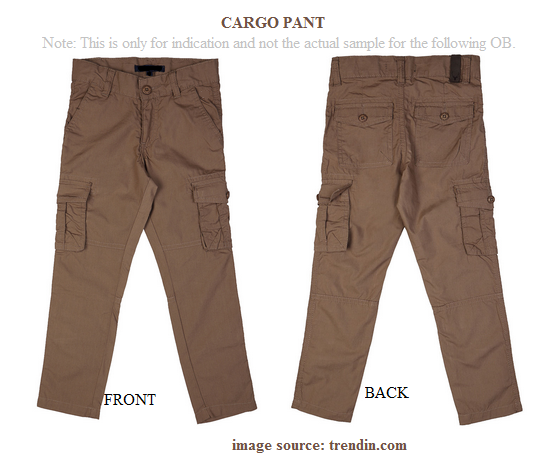 List of operations of a cargo pant. Machine types used to sew those operations are discussed in this post.